In July 2014 23,500 litres of unleaded petrol leaked from a tank at a Tesco filling station in Haslingden, Lancashire over a period of 29 hours. The leak was first detected 23 hours after it started, but incorrect advice was given internally which meant the leak continued for another 7 hours. The leak wasn’t reported to the Environment Agency. Petrol entered the sewerage system with the odours affecting residents up to one kilometre away, causing people to seek medical attention with headaches and sickness. The odours remained in the homes for a number of days. The incident had a major impact on the local community and environment with residents having to leave their homes due to petrol odours coming from the sewer network. The Environment Agency, Lancashire County Council, United Utilities, Lancashire Fire and Rescue Service and Lancashire Police worked together to respond. They found the incident was caused by Tesco’s failure to address a known issue with part of the fuel delivery system and an inadequate alarm system. It was made worse by their inadequate emergency procedures. Some of the petrol entered Langwood Brook and the River Irwell, causing a significant environmental impact, killing fish and other aquatic life. 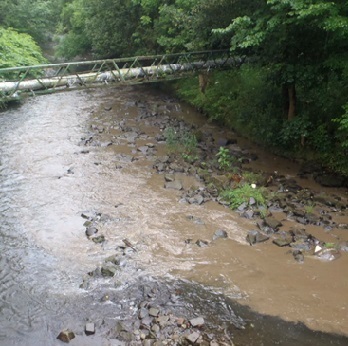 Samples taken from the River Irwell detected oil up to three miles downstream. Over 40 dead fish, including brown trout, were found within 1.5 miles of where the pollution entered the watercourse, with anglers reporting dead fish over six miles downstream. Around 7,000 litres of petrol were recovered at the site – the rest had escaped into sewers and the environment. Tesco were prosecuted under the Environmental Permitting Regulations 2010, the Dangerous Substances and Explosive Atmospheres Regulations 2002 and the Health and Safety at Work etc Act 1974. They were fined a total of £8 million when the case came to court in June 2017. They were also ordered to pay costs exceeding £57,000. The type of system used at the petrol filling station that caused the leak has been replaced at all 504 Tesco filling stations around the UK. The company have now installed a new real-time fuel monitoring system at all their sites. This means that if there’s a leak it can be detected and reported immediately. They’ve also updated their site emergency procedures to contact their environmental regulator if there’s a significant leak or spill.